GREETINGS FROM IRLAM, located nine miles west of Manchester on the old Manchester to Warrington Road. Nowadays, you might drive right past Irlam without noticing, as the new A57 by-pass takes you along by the Manchester Ship Canal, so it's important to take a right turn at the roundabout after Barton aerodrome. POST SCRIPT: August 1999 I received these three excellent photos from Ron McVeigh ronmcvey@globalserve.net in Ontario Canada, which he took during the 1950's. Ron served his apprenticeship at Lancashire Steelworks, Irlam, and worked on Manchester Liners. Those were the days! 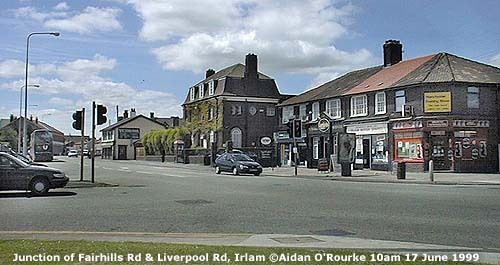 First impressions of Irlam are of a long road with residential areas on either side. Pubs include the Old Nags Head, and the White Lion. 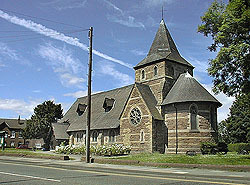 The eye-catching St John's parish church (above) is on the right, and a bit further to the left is Princes Park, with a recreation area, swimming pool and Irlam Hall. Keep going past the Fairhills Road and a few more pubs: The Station, The Ship and the White Horse and under a railway bridge, and you enter the ajoining town of Cadishead. IRLAM, earlier "Irwellham" is named after the river Irwell, which was incorporated into the Manchester Ship Canal, completed 1894. Sections of the old river remain at the bottom of Princes' Park (above), and are a pleasant location for fishing or walking the dog. 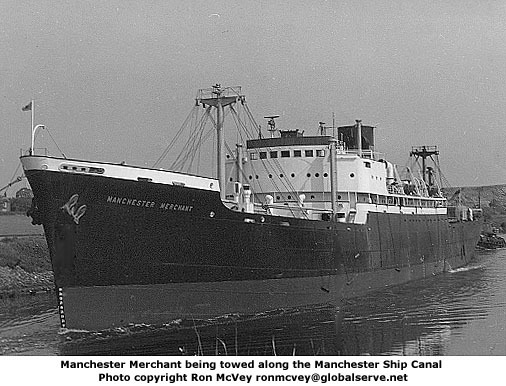 The Manchester Ship Canal passes along behind the town, cutting a long, slightly curving south-westerly path. Not many ships use the canal these days, though luckily I caught this one above earlier this morning. 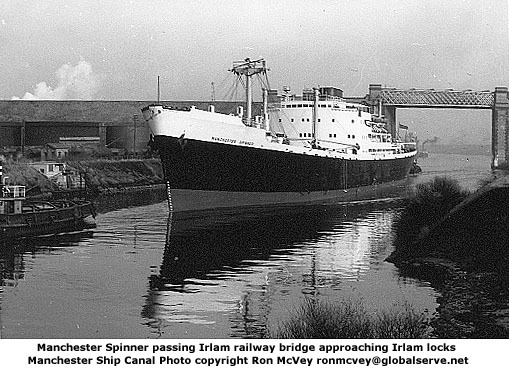 It was about to enter Irlam Locks, just up from the magnificent high-level railway bridge carrying the Manchester to Liverpool line - the bridge was recently refurbished by Railtrack at at cost of £7m, so trains can now cross it at full speed. 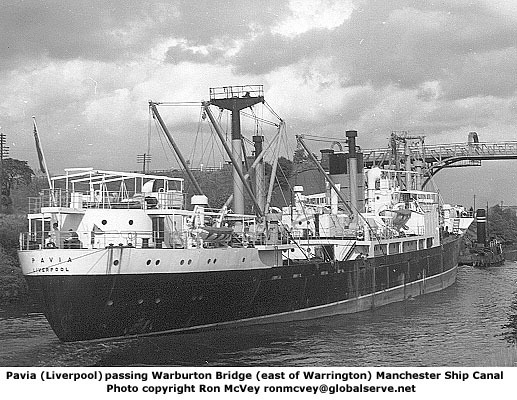 Just below the bridge is the where the River Mersey joins the Ship Canal. Transport routes are crucial to Irlam - from a dirt track at the dawn of history, to the turnpike, stage coach rotes, the Irwell navigation, the Ship Canal and most recently the M62, which passes just to the north west. IRLAM IS SYNONYMOUS with steel, even though the town no longer has a steelworks. 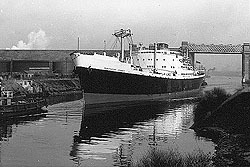 In 1910, the Partington Steel and Iron Co opened the first steelworks in Irlam near the Ship Canal and the Manchester Stockport railway. In 1930, the Lancashire Steel Corporation was formed from various companies, producing steel in large quantities through the Depression, World War 2 and up till the 60's when the industry was nationalised. 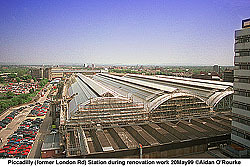 But in 1971 redundancies were announced, and by 1979, all steel production had ceased. Fustian - unbleached cotton twill - was once cut here to make velvet or the lesser quality velveteen. Hand-cutting continued till the 1920's. 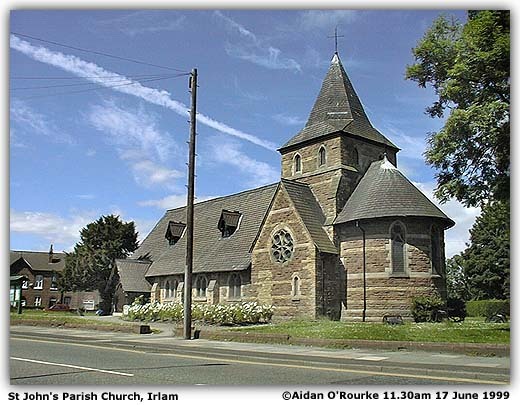 The local Library has information on Irlam's heritage, including fustian, steelmaking and other topics. Cyril Wheaton of the Irlam and Cadishead Local History Society has written several booklets on local history, which are available at the library. NEW INDUSTRIAL PARKS along the Ship Canal have brought a measure of economic regeneration, and new private housing developments, including Redrow Homes' "Waters Edge Park", and Harwood Homes' "Sycamore Meadows", give an air of contemporary gentility. 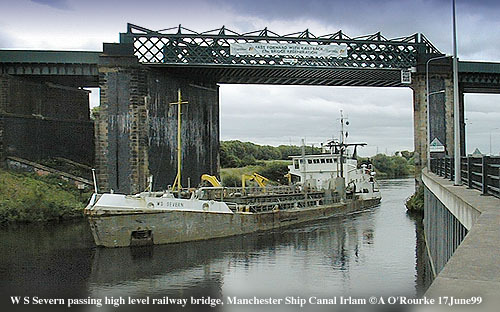 Irlam is a nice place to live, with quite reasonable house prices, good transport connectinos, and pleasant areas to walk, whether down by the old reaches of the Irwell, or along by the spectacular, though under-used Ship Canal - join me soon for the Liverpool Salford Ship Canal boat ride. IT'S A GLORIOUSLY SUNNY DAY here in Irlam, as I sit by Irlam locks writing this. TODAY'S MANCHESTER EVENING NEWS has just come out, and the front page carries a picture of the ever-youthful Cher, who'll be performing at the MEN Arena on 23 October. The other front page story is the case of a pensioner alleged to have been mistreated at the Royal Oldham Hospital. Airport correspondent Kevin Feddy reports that a group of people wanted to take a corpse as hand-luggage on a British Airways flight to Pakistan. The recently-unveiled plans for Piccadilly are now on display at the CUBE Centre for the Built Environment on Portland St. A guest book is available for people to put their viws - I'll be returning to this topic and CUBE on Portland St in coming weeks. "FAIRGROUND AT DAISY NOOK", the painting by LS Lowry is expected to go at auction for £180,000 in London - I'm looking forward to seeing all those Lowry paintings on show at the Lowry Centre, nearing completion in Salford Quays. 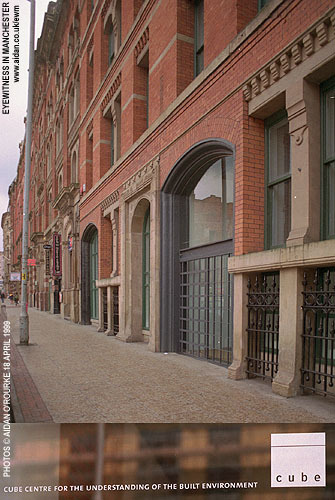 Manchester TEC (Training and Enterprise Council) are organising tours of Manchester for workers who come into contact with visitors, e.g. shop workers, taxi drivers and hotel workers. The aim is to make them more aware of Manchester's many attractions, and help project a more positive image of the city, rather than a place where it rains all the time. The tours are being conducted by Blue Badge tour guide and pal of mine Jonathan Schofield. Yesterday, the MEN reported that ex MEN Diary writer Andy Spinoza, and his PR company Spin Media, are to work on a formal basis with Marking Manchester, the government body set up to promote the city worldwide. A PLAN TO TAX FIRMS who give employees free car parking was yesterday's big story, and aroused quite a bit of controversy. The idea is to levy what's described as a "modest" charge, which, it's said, will pay for the entire Metrolink extension plan. Green campaigners are all in favour, but many motorists and company directors are less keen. It's thought the cost may well be passed on to the employee. Three quarters of respondents yesterday's MEN poll said they weren't in favour. those who won't - or can't - use anything other than their car. Untargeted measures, such as increasing petrol duty make no difference, and punish all three groups - currently the cheapest petrol costs 69p a litre, about 5 US$ a gallon. Instead, the second group should be targeted - they're the "floating voters" who can be won over to "greener" transport methods: - incentives such as cheaper fares, cheaper unified tickets, better and more frequent services, brighter and more cheerful stations... Measures such as these will make a difference - punishing car users won't. THAT'S ALL today from Irlam - I'll leave you with an image taken earlier in the day further up the Ship Canal - near Barton motorway bridge, carrying the M60 - it was cloudy then, but soon it became a bright and sunny, like yesterday. Let's hope it lasts. By the way, the pictures you see on today's page - apart from Piccadilly and CUBE - are the output of my new Agfa E-Photo 1280. Pretty good, but I won't be giving up film just yet! And it has a horrendous appetite for batteries - a set of 4 AA's used up in less than an hour - rechargeable ones are essential! Doing Eyewitness in the new format is great fun! Look forward to visiting many other local districts in the coming months. Let me know where you'd like me to visit, and if you can show me round, or know someone who can, even better! EYEWITNESS RETURNS IN THE NEXT FEW DAYS WITH A PICTURE UPDATE: COMING VISITS: THE CENTRAL LIBRARY, HYDE, CUBE, SHIP CANAL BOAT RIDE. Please join the mailing list and allow me to notify you when I make updates to Eyewitness in Manchester.